Toothbrush. Toothpaste. Mouthwash. Snacks. Bottle of water. Gum. Book. Did you remember to pack everything? Probably not. Don’t worry. A Boy Scout might have just what you’re looking for. When 18-year-old Ben Ricciuti was ready to select his Boy Scouts of America Eagle Service Project in the fall of 2016, he thought about his family’s experience when his grandfather had a lung transplant. There was a lot of waiting. In doctor’s offices. At lab appointments. For dry runs. At the transplant center during the surgery. And it wasn’t just his family. Other families were going through the same things. Waiting. Worrying. Everyone focused on the most important thing — the patient. “Loved ones have to go through one of the toughest times they will ever go through,” says Ben. Not everyone comes prepared for all that waiting. Ben decided he could help. 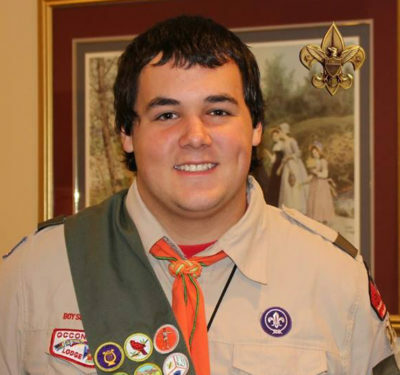 As a senior at Leesville High School in Raleigh, NC, Ben is a member of Boy Scout Troop 352 at St. Francis of Assisi Church. He’s been very involved in scouting for 12 years, starting as Cub Scout. He also plays football and plans to attend college at Randolph-Macon College in Ashland, VA. 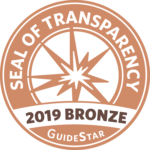 According to the Boy Scouts of America, scouting is about service to other people. The service project is a reflection of the Scout as a leader and should have a significant impact on the community served. 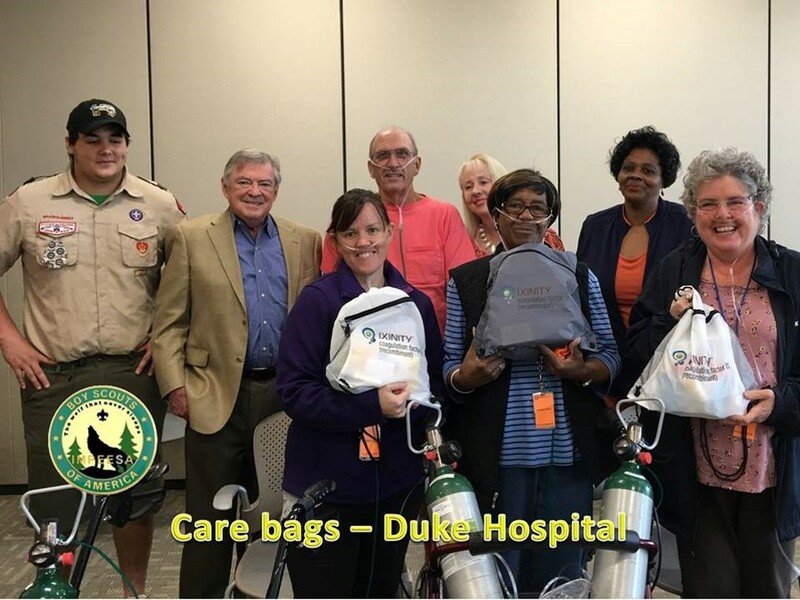 As his grandfather was going through the lung transplant process at Duke University Medical Center in 2012, Ben observed that his mother and grandmother didn’t always have a “grab and go” bag prepared to keep themselves fed and occupied while they waited. It sparked an idea that would become his Eagle Service Project. Ben’s goal was to prepare 50 Waiting Room Prep Bags with “snacks, hydration and something to do.” He recruited friends from his Boy Scout Troop and the football team to distribute fliers to homes, schools and churches in the neighborhood requesting donations. The response was overwhelming. Ben and his group of volunteers had to make multiple trips to pick up items donated by more than 350 people and businesses. His family’s garage was overflowing with food, water bottles, hygiene products, games, toys and bags. “I was in disbelief the day we started collecting bags,” says Ben. With help from his friends, the items were sorted and stuffed into the donated bags. Each bag included 5 snacks, toothbrush, toothpaste, mouthwash, soap, lotion and some form of entertainment – cards, games, toys, books, etc. They were even able to make some allergy-free bags containing no peanuts! In November 2016, Ben delivered 250 bags to Center for Living at Duke University Medical Center. The bags filled an entire storage room. But the story doesn’t end there. In addition to the Waiting Room Prep Bags, Ben had enough extra items to make donations to Hurricane Matthew relief, local food drives, Toys for Tots and 150 smaller bags (made by his aunt) of hygiene items were given to a women’s shelter. The Center for Living relays notes to Ben from bag recipients and he says he is still getting “thank you” emails. Service to other people. Check. A significant impact on the community served. Check. Ben achieved the rank of Eagle Scout on Dec. 14, 2016, and attended the Court of Honor, the Boy Scouts formal recognition ceremony, on March 11, 2017. His very proud grandfather was there to cheer him on.